Illumion is the band of Eveline van Kampen. A graduate of the conservatory in 2002 and for the quality of the vocal parts this is highly noticeable, not a note off and technically very skillful. She took a study trip to China which explains the symbols on the cover and the use of the erhu, a Chinese two-stringed violin. Eveline is joined here by two members from S.O.T.E., Peter H. Boer (basses, sticks, keyboard) and Emile Boellaard (drums). The keyboard players are Eveline Simons, who during the process was replaced by Annemiek de Boer. Finally the guitar is played by Eveline van Kampen herself. The music is described as The Gathering vs Magenta with dashes of Ayreon, I would like to add Ambeon to that list. The two members of S.O.T.E. are both in the rhythm section, which means that the rhythms are a bit more complex than usual and as I really like the latest S.O.T.E. album, I do not mind this at all. The vocals of Eveline are very beautiful and the vocal lines are very enchanting like, not your normal straightforward singing. This is the reason I added the Ambeon project to the list above, as the vocals on that album come closest to that of Eveline van Kampen. For the guitars, however Eveline should have asked the third member of S.O.T.E. as the music needs lots of melodic structure and at times this is forgotten and a simple chord is played. Sometimes the rhythm guitar is distorted while the music yearns for a sweeter approach. Though the use of the Chinese instruments is terrific, especially on Into The Labyrinth they come out very well. 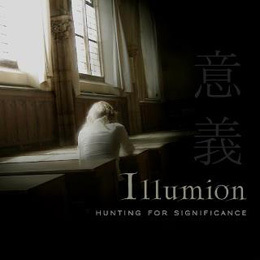 Hunting For Significance is a very beautiful album. If you like beautiful music with enchanting female vocals then this is the album for you. The album has no remarkable highlights and seems to flow by, a bit dangerous because listeners might lose attention. If you however are not distracted, then this is a wonderful journey. At times I would have liked if a different mood was chosen, not so dark all the time, but on the whole it is a solid debut. If you like prog with female vocals then this album is recommended.